It bred some new trouble and fear to my spirit; but He was graciously pleased to set home that word ‘He does all things well; Trust in the Lord and fear not what man can do’; which brought peace to me in such measure that I was made to wonder; for all the time the officers were in the house He supported me so that I was not in the least discouraged before them. That evening, Mr. Bell stayed long at a friend’s, drinking and talking until past ten. When he left for home, it was not only dark but a chilling cold was moving through the area. He never arrived at his residence. . Two days later, his body was found in the river, frozen all the way up to his arms in a solid block of ice. 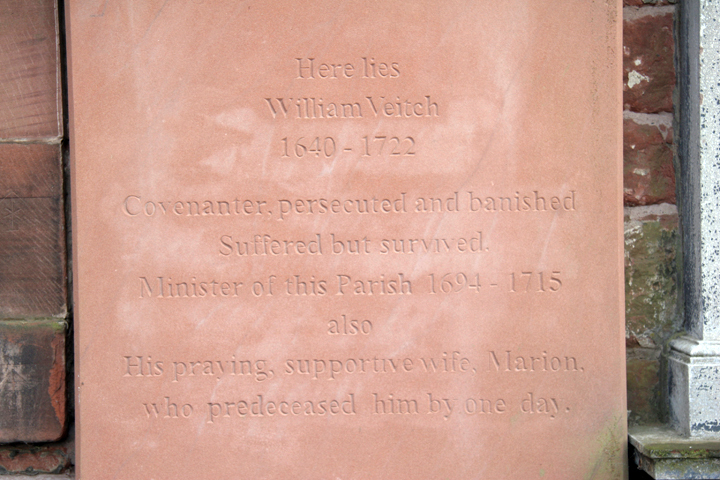 Later, William Veitch was released and him and his wife lived to a good old age, dying within one day of each other. They passed on their godly heritage to their children and grandchildren. There is a peace that passes all understanding, and the providence of God works in all circumstances for the good of His own.